This has been a hard post to write. And I blame it, I do, for keeping me from posting to this blog on a regular basis ever since The Souse Report received a bottle of Creme Yvette and embarked on a tasting odyssey which led us… well… not quite where we expected to go. I have to admit an almost ridiculous level of excitement and anticipation of the resurrection of Creme Yvette. It is not every day that a defunct ingredient is pulled from the dusty pages of cocktail history and returned to us. 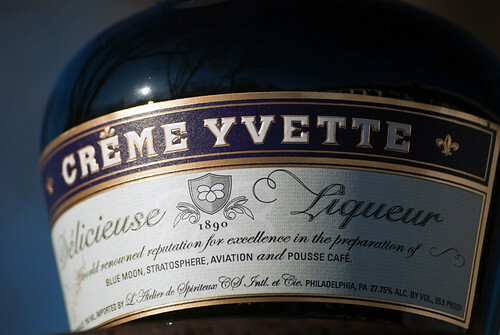 Creme Yvette, for me, had attained almost mythical status, and every time I consumed a Blue Moon or Aviation made with Creme de Violette I found myself dreaming of the day when I would be able to enjoy them restored to their former glory. Creme Yvette was originally produced in America, starting in the late 1800s, by the Sheffield Company. The rights and recipe were purchased in the early 1900s by Charles Jacquin et Cie., a company which was purchased in turn by Maurice Cooper following Prohibition. Creme Yvette became defunct in 1969 but has now been resurrected by Robert Cooper of Cooper Spirits International, grandson of Maurice Cooper and the man who brought us St. Germain Elderflower Liqueur, bless him. 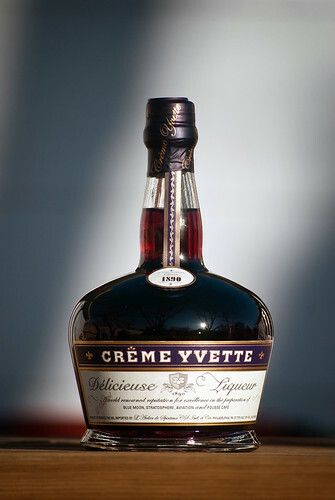 Creme Yvette was, and is, a liqueur made primarily from violets, orange peel, honey, and berries. In the time that it has been unavailable, forty years or so, its most common stand-in has been Creme de Violette. We decided to compare the two liqueurs side by side, straight and in several classic cocktails. The result was not quite what we expected. First off was the direct comparison. 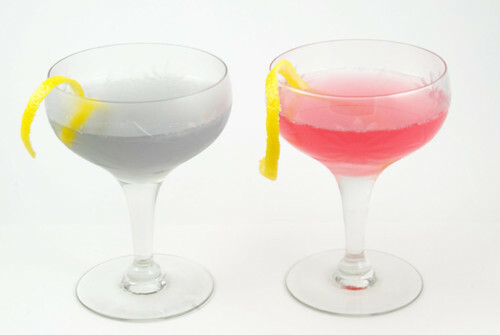 You can see the two participants in the photo above, Creme de Violette on the left, Creme Yvette on the right. The first thing we all noticed was the difference in color. 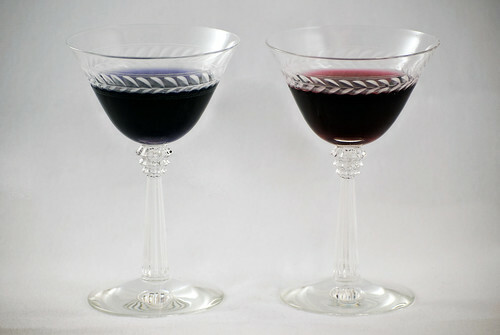 Creme de Violette is purple, while Yvette is red. Very red. I was not expecting this at all, as the one photo I found of a bottle of vintage Creme Yvette led me to expect a very similar purple color to that of the Creme de Violette (www.flickr.com/photos/donbert/877512124/). 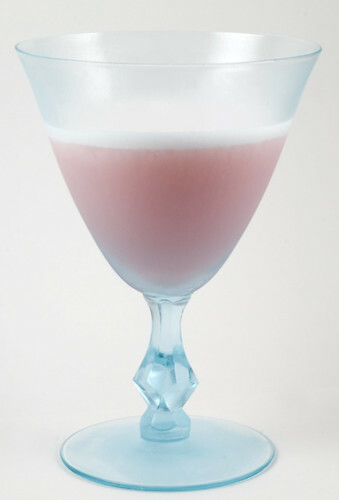 Creme de Violette contains coloring, while Yvette does not, and it is possible that the original Yvette did. This may explain the color difference but at this point I don’t have any definitive information on the topic. The taste of the Creme Yvette is much more complex than the Creme de Violette. The berries and orange are very present, along with a strong suggestion of vanilla. The floral notes are more subdued, creating a contrast with the Creme de Violette where the floral notes dominate and there is little else to distract from them. Creme Yvette may even have more in common, in my opinion, with Parfait Amour, which could be described as Creme Yvette on steroids but with the violet removed. For our first comparison cocktail, we went with the Blue Moon. This is a favorite of mine, both in its common lemon juice bearing version and the older, quite dry, vermouth version. The first thing we noticed was the big color difference. Since we had all become pretty used to the steely purple/grey color of the Creme de Violette Blue Moon, the hot pink Creme Yvette version was disconcerting to say the least. It probably affected my evaluation of the taste of the drink as well. The Creme Yvette variation seemed sweeter, almost cloying, and not as well suited to the Blue Moon. Possibly it is only an attachment to the familiar that made this shift seem so jarring, and I plan to give it another shot in the future. This drink, if I am remembering it correctly now, was better suited to the Creme Yvette. None of us had tried it before either, so that may have given us some objectivity in the evaluation that was lacking with the Blue Moon. Overall, Creme Yvette was not the revelation any of us were expecting, but it was quite interesting. I think our expectations may have been too high for any liqueur to live up to. The good news is that it continues to grow on me and I plan to keep trying it in a variety of drinks and, hopefully, reporting on it here. Stay tuned.